Thanos’ plan is to bring balance to the universe by killing off exactly half the inhabitants. On the way there Loki, Gamora, and Vision end up dead. And then on top of that Thanos gets exactly what he wants. Black Panther, Spider-Man, Doctor Strange, Bucky Barnes, Falcon, Scarlet Witch, Star-Lord, Groot, Drax, Mantis, Nick Fury and Maria Hill all die. They turn to dust, blown away by random selection. And whatever might happen in the sequel, whatever Stephen Strange saw that made him tell Tony “this was the only way” before crumbling into dust, these deaths feel real. They affect the characters and they effect us on an emotional level (or they should — if you can watch Peter Parker die in Tony Stark‘s arms as an MCU fan without at least getting choked up I’m not sure you’re human). As much as I love fictional characters, there’s a part of me that rebels against the idea that all the important people are safe. And that part of me appreciated that there were real stakes in this film. 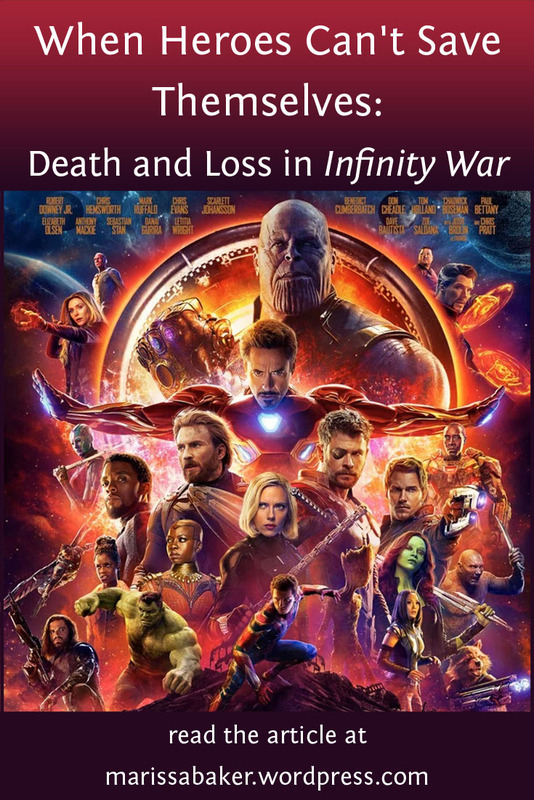 Barring significant time-travel, the characters who died before Thanos triggered universal genocide seem like they’re going to stay dead (except perhaps Gamora). And even if everyone who got dusted is brought back that doesn’t guarantee anyone is safe in the sequel, since some of the upcoming films could in theory be set before the events of Infinity War. It irritates me when a film or show kills of characters and they never stay dead. The Librarians did this in their final season and even though I hated that the character died it infuriated me that they undercut all the other characters’ development to bring him back. 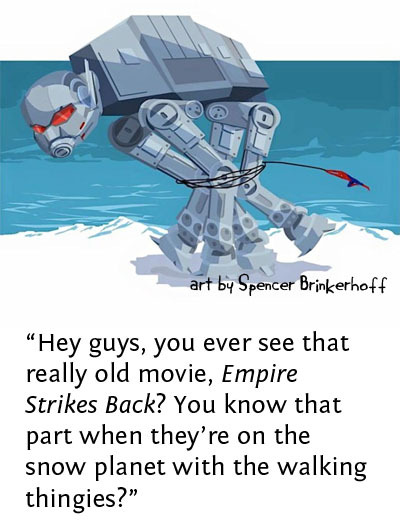 It cheapens the storytelling when you take away the danger and use tricks to undo everyone’s mistakes. So even though it sounds rather evil, I’m actually hoping for permanent deaths in the MCU. And I want the characters who do come back to remember that they died. I don’t want it written off as unimportant. In real life, mistakes have consequences. When people die they don’t come back. And while one of the main premises of superhero films and other sci-fi/fantasy stories is that they give us an escape from “real life,” they still need to feel real to resonate with us. The characters’ emotions, struggles, temptations, relationships, and even their deaths ring true because we can identify with them. Death, loss, and failure are part of life. Even for superheroes. As Thor points out when talking with Rocket, his mother was killed by a dark elf, his father died, he had to kill his sister, he’s watched his brother die twice, his best friend was just stabbed through the heart, and he lost his planet. But none of that really involved him definitively losing a battle. He has lost things, yes, but his enemies lost more. Even heroes can’t always save themselves, their friends, or the world they’re sworn to protect. We understand this. In fact, I haven’t actually heard anyone say that they’re angry because the superheroes lost and that’s not supposed to happen. 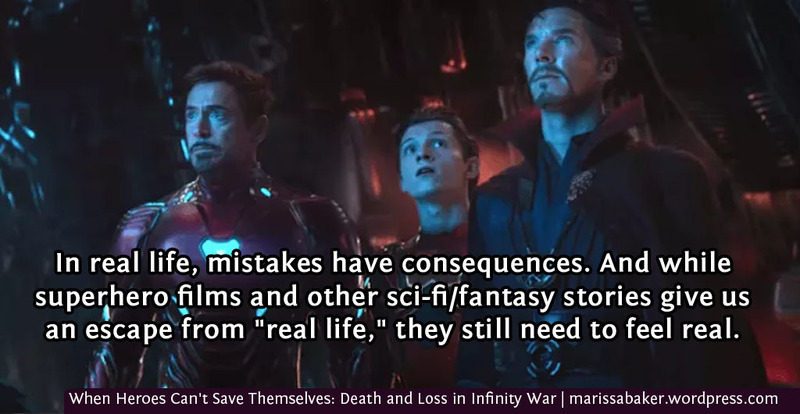 In fact, the HISHE reviewer said his favorite thing about the film was that “heroes actually died.” The fact that mistakes had consequences and doing your best isn’t always good enough resonates with us. Maybe part of the reason we can mourn the character deaths while also appreciating the bold risks filmmakers took in killing off major characters is because we know there’s a sequel. Or perhaps it’s because we’re a jaded enough audience that we don’t expect good to always win. But I think it’s because the deaths gave this story the emotional resonance it needed to make this film matter. 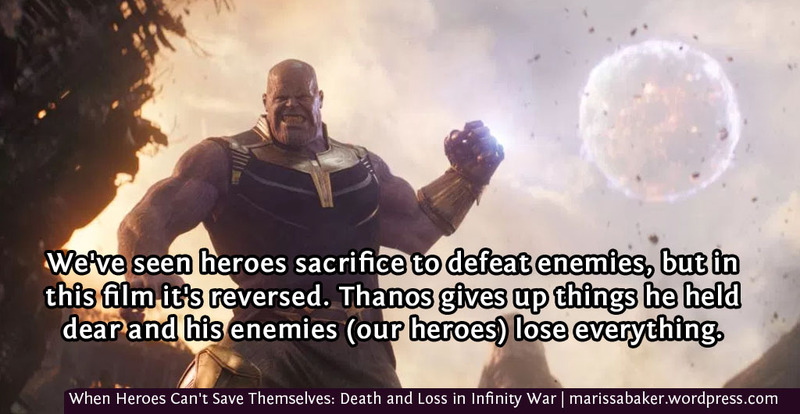 When you strip away all the explosions and battles, the conflict between the Avengers and Thanos is an ideological one. The Avengers, in Captain America’s words, “Don’t trade lives.” They won’t make cold calculations about who does and does not matter. They’ll save as many individuals as possible because they believe every life has value. So which one is right? If we believe Thanos, he saw his fears of extinction play out when his own planet died because they refused to make the hard choice necessary to survive. And the planets that he’s already culled are now thriving because there’s no competition for resources. But the universe is not grateful. The universe is Tony Stark holding the closest thing he has to a son as he dies. It’s Okoye’s world falling apart as the king she swore to serve crumbles mid-sentence when he reaches out to help her. It’s Captain America collapsing on the ground because this time giving everything he had wasn’t enough to protect the people he loved. And it’s us crying out that this can’t be how the story ends.